As the war in Spain dragged on, divisions among the Spaniards in New York became more and more pronounced. 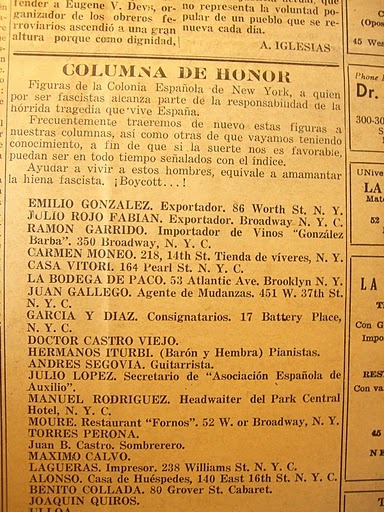 The pro-Republican paper “Frente Popular” regularly “outed” the city’s Spaniards who were pro-Franco or insufficiently pro-Republic. 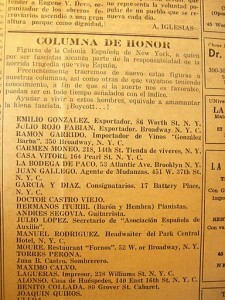 “Figures of the Spanish Colony of NY, who, because they are fascists are in part responsible for the horrible tragedy that Spain is suffering… Helping these men live is like giving suckle to the fascist hyena. Boycott!” The list includes many prominent Spaniards, like the guitarist Andrés Segovia, the renowned eye surgeon (and pioneer of the cornea transplant) Ramón Castroviejo, the owner of “El Chico” nightclub on Grove Street, Benito Collada, and the owner of the city’s most important Spanish grocery store (on West 14th St.), Carmen Moneo.